We’d love your help. Let us know what’s wrong with this preview of Aesop the Fox by Suniti Namjoshi. Aesop’s fables are brought to life by the timely intervention of Sprite from the future, who prods Aesop into debate about the meaning of stories: are they for fun, or do they have the chance to change the world? This book offers a virtuoso display into how the building blocks of fables can enchant, enrage, enlighten and educate us all. Very little is known about Aesop who Aesop’s fables are brought to life by the timely intervention of Sprite from the future, who prods Aesop into debate about the meaning of stories: are they for fun, or do they have the chance to change the world? This book offers a virtuoso display into how the building blocks of fables can enchant, enrage, enlighten and educate us all. Very little is known about Aesop who was supposed to have been a slave on the island of Samos in the sixth century BC. It is his fables (and those attributed to him) that have come down to us through the centuries. In these tales, a fabulist from the future, referred to as Sprite, hoicks herself back to his century. “Why didn’t you save the world?” That’s the Sprite’s cry. Aesop, meanwhile, is trying to save his skin, make up his fables and live his life. Given the pitfalls of human nature, are the fables an Instruction Manual for staying out of trouble? What about morals, what about reform, what about the castigation of social evils? Sprite nags and cajoles and begins to wonder how much power a writer really has. The book offers a virtuoso display of how the building blocks of a fable can be used in a variety of ways. It’s witty, it’s satirical and the Sprite herself is a comical figure. But at the end, when she has to return to her own time, that is to our own time and to our broken world, her central question suddenly seems less absurd, and far more urgent. Suniti Namjoshi is an inspired fabulist. To ask other readers questions about Aesop the Fox, please sign up. I agree with Rachael: this is a remarkable book! Suniti Namjoshi has taken the fables of Aesop and stories from the ancient "Life of Aesop" and inserted herself into the cast of characters as a time-traveling, bodiless Sprite who is the book's narrator. The Sprite meets up with Aesop (he's the one who actually yanks her into his world), along with his friend Androcles, then she sees them sold from one master to another, and finally she accompanies Aesop on his fatal/fateful journey to Delphi. Do I agree with Rachael: this is a remarkable book! Suniti Namjoshi has taken the fables of Aesop and stories from the ancient "Life of Aesop" and inserted herself into the cast of characters as a time-traveling, bodiless Sprite who is the book's narrator. The Sprite meets up with Aesop (he's the one who actually yanks her into his world), along with his friend Androcles, then she sees them sold from one master to another, and finally she accompanies Aesop on his fatal/fateful journey to Delphi. Don't worry: you don't need to have read Aesop's fables or the Life of Aesop to enjoy this book, but if you do know something about the ancient Aesop, you get the extra bonus of seeing how Namjoshi is twisting and poking the old stories, often turning them inside-out. The Sprite has a warm sympathy for all her characters, major and minor (Pythagoras even makes an appearance), and she also challenges them as they debate the possible morals of the fables, and the meaning of freedom, of love, and of storytelling itself, and the duties of the storytellers. Scholars have long discussed the striking similarities between Aesop's fables and fables from ancient India (Buddhist jatakas, the Panchatantra, etc. ), and Namjoshi poses her own interpretation: Aesop is from India! That's one of the book's best surprises, but I'll stop now before I give anything else away. If you love stories and storytelling, READ THIS BOOK. It is a delight from start to finish! I have long used a fox as my social media avatar in honor of Aesop's foxes, and now I do that with an even greater appreciation of "Aesop the fox." I had heard great things about this book, so when I received it from Spinifex I was beyond ready to be blown away. Though the Namjoshi’s writing is fantastic, unfortunately this book didn’t captivate me as much as I hoped it would. It took me a little while to wrap my head around the book and where things were going and I felt like I was rereading Animal Farm by George Orwell again, with the animals talking and the humans. This may be a little odd and confusing but still with it for at least a few more pages and you will get drawn in. This story is about Aesop, a famous Greek story teller who is visited by a spirit from our time. The sprit named Spite share with the readers more about Aesop’s life, from his time as a slave to the storyteller that we all know him for today. I should also mention that the characters in this book are charming and delightful. This short book was extremely well written, I actually cannot get over this or possible rave about it enough. Namjoshi is unique and has a charismatic way with words. The story line wasn’t enough to get me hooked but it was still interesting all the same, which includes the cute illustrations that are throughout the book. I will be keeping an eye out for Namjoshi’s work in the future, like I said before such a captivating writer! 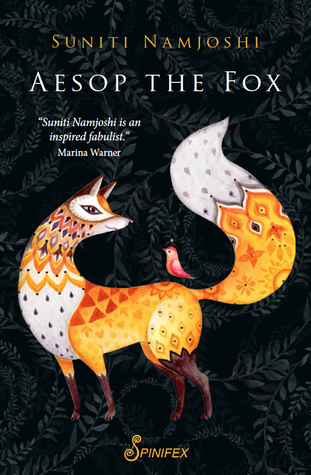 Aesop the Fox is Suniti Namjoshi’s first novel in six years, and those familiar with her fiction works will be glad to see the return of her typically playful and inventive prose. She casts Aesop in the roles of melancholy slave and clever story-teller. Reflecting the eponymous character, it is a book of two halves. In the first, the narrator is ripped mid-way through life from the twenty-first century into the Ancient Greek world of Aesop. At first, the story skips along whimsically from vignett Aesop the Fox is Suniti Namjoshi’s first novel in six years, and those familiar with her fiction works will be glad to see the return of her typically playful and inventive prose. She casts Aesop in the roles of melancholy slave and clever story-teller. Reflecting the eponymous character, it is a book of two halves. In the first, the narrator is ripped mid-way through life from the twenty-first century into the Ancient Greek world of Aesop. At first, the story skips along whimsically from vignette to charming vignette. Aesop, the narrator and the characters share quips and tales, as they mull over the stories’ meanings and integrate them into the everyday, slowing every so often to satisfy childish queries. ‘Why don’t we just go fast and steady on that horse and cart, Aesop?’ The stories’ meanings change as interpretations are shuffled between characters. Indeed, the moral of the story is often cheekily inverted. The second half turns toward the meta. A child asks, ‘Do all stories mean something’? The famous slave’s reply smacks of Derrida (albeit Derrida on a lucid day) ‘each time a story is told it means something different’. ‘And each time it’s heard’, interjects the narrator. The moment swiftly passes, yet this simple assertion, pitched to curious children, throws up a much larger concern of the book: whether the seemingly timeless wisdom of Aesop’s fables is drawn from the simplicity of ancient life, stripped back to a deeper truth, or if such wisdom is fashioned and reimagined, contingent on the moment of its retelling. Indeed, midway through the story, the narrator asks Aesop, ‘What do I want from you?’ And what could our narrator – a time-travelling, self-proclaimed feminist – possibly have to learn from a disenfranchised bard who predated the very question of gender equality? The value is clearly in the fact of the dialogue. And, more importantly, it is in the joy of story-telling. Yet, as the book winds towards a close, the fables begin to dry up, and the narrator gives the impression that she is losing control of her story. Grappling with the contours of history, what’s plausible and what seems true, she fears for Aesop’s life as he approaches his historical end at Delphi; and she questions the possibilities of authorial power. Throughout the novel, the reader experiences Aesop’s stories in their imagined, classical context, and a strange disquiet seeps in. It is the emergent insanity of teaching one’s children morality through these cautionary tales, produced in the misogynistic and slave-ridden world of Ancient Greece. Aesop and his fellow slave Androcles are beaten bloody on the slightest impingement and betrayed without justification by their master Xanthus. Of the women silence is expected; even the noble woman Aglaia has a fettered voice that she must deploy only with care. After being sold to a kinder master, Aesop has an understated love affair with his master’s wife. Aside from the obvious and irresistible temptation to make this figure – synonymous with morality – an adulterer, this sub-plot serves no discernible purpose. It feels a little like it has been shoe-horned into the novel, to compensate for the uncertain relationships between the characters – relationships that remain somewhat unsatisfactory, and almost peripheral, throughout. But such short-comings are ultimately beside the point. The first half of the book will appeal to all. Lucid and engaging, it sweeps the reader along in wonderful fits and starts. While the second half loses its momentum, it is chock-a-block full of insight for writers and creators in particular. And the author has conducted sufficient historical research that only the most austere of classicists will fail to appreciate this novel. At its best, it is a light-hearted jaunt into an uncertain past. At its most profound it is a dialogue with that past on the nature of morality and its bleak potential to shape our own uncertain future. Suniti Namjoshi is a poet, children's author, and teacher. She ran a collaborative fiction site in the late nineties called The Reader's Text of Building Babel. She lives in England with her partner Gillian Hanscombe.